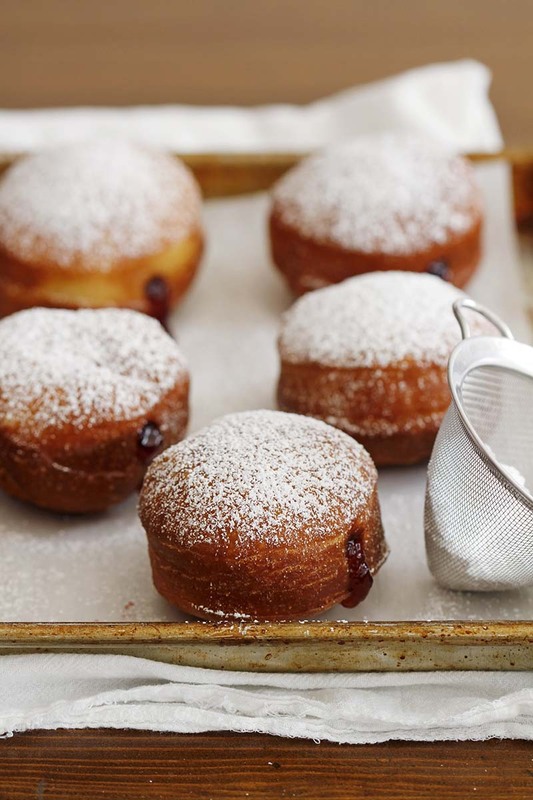 Tender, fluffy and filled with blackberry jam, these easy and delicious brioche doughnuts are sure to become your new favorite breakfast treat! In large bowl or bowl of stand mixer fitted with dough hook attachment, stir 2¾ cups flour, nonfat dry milk, sugar, salt and yeast until combined. Add eggs, egg yolk, warm water and butter. Stir just until dough forms. On lightly floured surface, knead dough by hand 10 to 15 minutes, adding just enough of remaining ¼ cup flour until dough is soft, smooth and elastic; OR, knead dough in stand mixer with dough hook on low speed 10 minutes, adding just enough of remaining ¼ cup flour until dough is soft, smooth and elastic. Punch down risen dough. On lightly floured surface, press dough into ½-inch thick circle. Use 3-inch round cookie cutter to cut dough into doughnuts (you may re-press the scraps once to cut more doughnuts). Place doughnuts on parchment paper-lined baking sheet. Cover with towel and let rise 1 hour. Meanwhile, heat 2 inches oil in large saucepan over medium heat until candy thermometer reads 350°F. When doughnuts are fully risen, use slotted spoon to drop 2 to 3 into hot oil. Fry on both sides until deep golden brown. Remove with slotted spoon and transfer to paper towel-lined plate or baking sheet. Repeat with remaining doughnuts.